(2) Create a pattern with a free-hand drawing or googling a heart template—or do like I did and use a heart-shaped cookie cutter. (3) Trace around your pattern on two pieces each of white and various pastel felt. (4) Lightly pencil a candy saying on a heart of each color, then embroider all the sayings in red. (5) Put the hearts of the same color back to back and attach the edges with a blanket stitch using a coordinating color of embroidery floss. Stop a couple of inches before you’re done to add a bit of fiberfill stuffing, then close them up. (6) Use your hearts for valentines, brooches, magnets, hair accessories, sachets, mobiles, or gift-wrap, wreath, or pillow a-la-mode; display them in a pretty bowl or shadow box; or . . . make GARLAND! I added in some of my red-sweater hearts as well for the perfect Valentine mantel decor. They are lovely, so cute! Oh cute!! love your garland! and, er, is there any research material left? This is so adorable. The thing I like best is that it’s a cute craft that kids will love but it is also a great adult craft to display in February. Thanks for sharing! Love the puffy heart garland — that’s so cute and festive! And my family is always down for projects that involve “research”! It’s our favorite thing. Wonderful post. They are great and all ages would “get it”because the lollies have been around for a long time. I rather feel like having one now. Your’s are best because they last longer. I think they would look really good in a row of 4 or 5 as a broach. See, this is the missing ingredient in my hearts. I was looking at stuffing when I should be looking for candy to fill it with. Genius!!! These are super cute, Katherine! And any excuse to buy candy for research sounds good to me! So lovely! I would have to put them high up as my dog Ruby would love to rip the stuffing out of them……..
just too cute…love the garland…Samples please! Great idea Katherine! Love it! 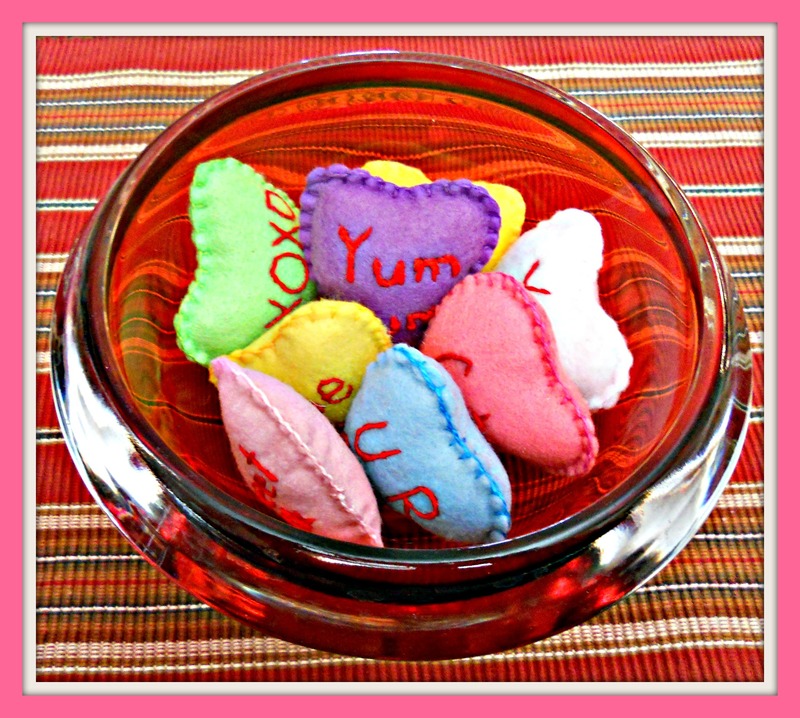 Love those little “candy” hearts– nostalgic fun! These are so cute, you always have the greatest ideas 🙂 My 3 year old would love these! I really love this idea! It’s super, super cute. If I start on one now, I’ll have it ready for Valentine’s Day 2014, ha ha! That looks so jolly and fun Kathryn ! I thought of making felt heart Valentines this year for school but in the end went with paper. Basically because I had the paper but not the felt. Very kind of you…i hope you to like my blog how I do yours! Have a marvelous day my new friend! I love your garland! It’s so sweet. I love to see hearts year-round! I am a first time visitor to your blog and I love the ideas I see. I found you because of Ginny of My Time Stitching nominated you for the Versatile Blog Award. I was checking out her nominees. I look forward to more. I love it. I’d rather buy it though. 😉 I’m sure that’s not the popular response here, but I’m being honest.